When I covered this report back in 2016, I focused on five habits of highly successful marketers. But now it’s time to go deeper. 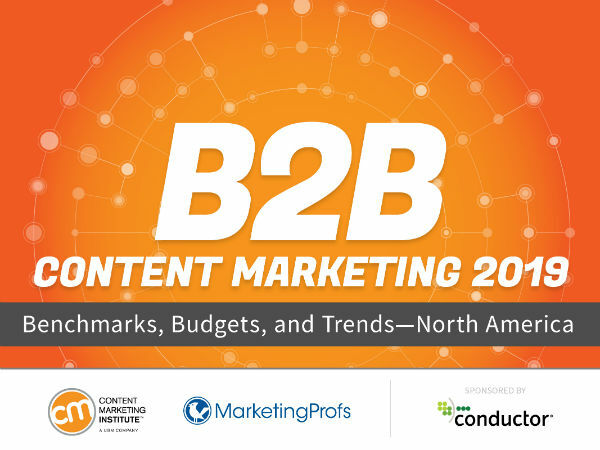 Here are 10 opportunities from deep in the 2019 B2B Content Marketing Benchmarks — opportunities you may be overlooking. Let’s start with an easy one: Only 11% of respondents clocked in at the “Sophisticated” level of content marketing maturity. Even among the most successful, the number is shocking low: 33%. Just a third of the people who are really rocking it with content marketing are sophisticated. What needs to change? To get from “Mature” to “Sophisticated,” marketers need to provide accurate measurement to the business, and start scaling content marketing across the organization. That means working with other departments (like Human Resources, Customer Experience, and of course Sales) to find synergies and expand your efforts. And it means getting serious about measurement (more on that later). Good news! More respondents had a documented content marketing strategy than last year. Bad news? Sixty-one percent still either don’t have a strategy, or don’t have it written down. We know that a documented content marketing strategy is one of the strongest indicators of future success. But let’s dig a little deeper. Even for those who have a documented content marketing strategy, only 52% say their strategy makes it easier to identify which metrics to focus on. This stat isn’t as dire as the first couple, but it’s still jarring: Only 66% of respondents said they have used paid methods to distribute content. That means a third of marketers are relying on organic reach and existing subscribers to get their content seen. Why rely on people to choose your content? Why not go out and get the people who will most benefit from seeing it? Paid social media and paid search ads are both critical parts of comprehensive content promotion. Only 23% of B2B marketers say they use community building and audience participation to nurture audiences. For a modern digital marketer, this should be a no-brainer. We have more options than ever before to communicate and build relationships with our audience. We should be participating in forums, available on social media, initiating dialog and encouraging conversation. Most importantly, we should be helping our audience form a community identity with the brand as its center. Data is a driving force for marketers, and big data is only getting bigger over time. But let’s not throw out the small data. The majority of respondents don’t use customer conversations as a top technique for audience research. Just 42% said talking directly to customers was a priority. There’s no substitute for first-hand knowledge from real customers in real-time. Talk with Sales and Customer Service about their experiences, but also arrange for your department to collect data straight from customers, too. I’ll be brief: 52% said they craft content based on specific stages of the journey. That means nearly half don’t. They should. The buyer’s journey should inform everything from keyword and topic selection to execution. Aim for a mix of Attract, Engage and Convert-stage content, with the majority on that first stage. Here’s a disconnect: 64% said their organization places importance on building relationships with influencers. But only 24% said they actually partner with others on content marketing initiatives. It’s good to develop relationships with influencers who can help promote your content. However, they’re far more likely to promote when it’s their content, too. Co-create with influencers and you’ll see a boost in motivation, amplification, and excitement for the finished product. Social media sites have made it painfully clear that we don’t own our audience on their platforms. We can only rent access to them, at rates that are continually getting steeper. That’s why it’s crucial to bring your audience to your own land. Just 43% said they’re trying to build a subscribed audience with their content marketing. That’s a missed opportunity for over half of us. It’s powerful to have your audience opt into your content (and potentially into your community). Marketers are excelling at top-of-funnel measurement. Fully 81% said they had successfully created brand awareness through content marketing in the past year. However, we’re still having immense difficulty proving success at the bottom of the funnel. Only 45% said they have successfully used content to generate sales. Overall, 49% of respondents said they can measure the ROI of their content marketing. But the gulf between most successful and least successful is huge on this one: 72% of the most successful can measure ROI, while only 22% of the least successful can say the same. The ability to prove the value of your work in straight return on investment is crucial for a number of reasons. First, it makes it easier to secure budget and expand programs. Second, it helps shift the perception of marketing from cost center to revenue center. Perhaps most importantly, the ability to prove positive ROI requires a higher level of sophistication. It requires becoming both more effective and better at measurement and reporting. As such, proving ROI should be the goal for any organization looking to level up their marketing. Content marketing has proven its value as a modern marketing tactic. We’re well past the trial stage, past the hype stage, and now we can settle into the refinement and sophistication stage. Use these 10 tips to start leveling up your content marketing now. After all, we only have 12 months until the next benchmarks report. Wouldn’t you like to be in the “most successful” section? At TopRank Marketing, we believe content marketing success is rooted in becoming the best answer for your audience, wherever and whenever they’re searching. Your buyers have questions and you have the answers. But how detailed do you have to go? Check out Lee Odden’s post on long-form versus short-form content.